Dexion Push Back Racking is used where pallets are stored in a blocks, typically 3 or 4 high x 3 or 4 deep x any quantity left to right. The pallets are positioned on small telescopic carriages which are pushed back when the next pallet is offered into location. 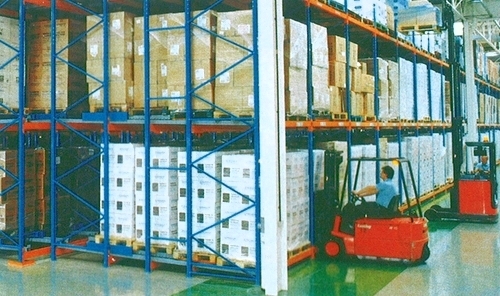 This is a very efficient form of storage and can be accessed for either locating or retrieving pallets by any type of fork truck. 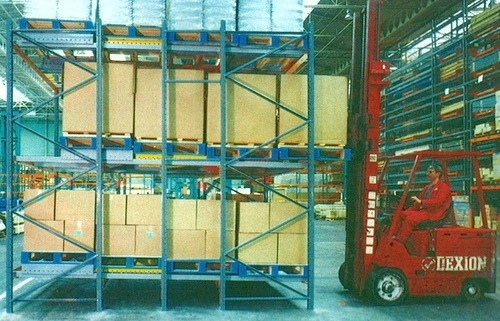 The pallets are required to be a consistent size and the loads should not overhang the pallets. The common usage is for collating a particular product / pallet type in a goods out area, awaiting dispatch or where space is a premium and the quantity of pallets does not make a Narrow Aisle option viable due to the additional cost of the narrow aisle fork trucks. Hampshire Mezzanine Floors can carry out repairs and safety checks to existing Dexion and other racking installations and we can advise on rack protection and general warehouse safety. 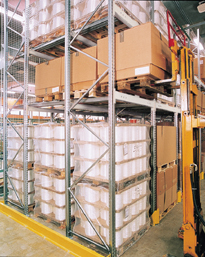 For further information on Pushback Racking, please contact us for a site survey.